In Part 2 of ‘Hosting WordPress Yourself’, I showed you how to install Nginx, PHP-FPM and MariaDB, which formed the foundations of a working web server. In this post I will guide you through the process of setting up individual sites within Nginx (known as server blocks or virtual hosts) and the process of installing WordPress via WP-CLI. At the end of this post I will also demonstrate how to connect to your server using Transmit (file management) and Sequel Pro (database management) for those who prefer to install WordPress manually. Let’s get started. Create a DNS record for the domain name you wish to serve traffic, which points to your server. Setup a server block so that Nginx knows how to deal with the request. By default, Nginx will drop any connections it receives, as in the previous post you created a catch-all server block. This ensures that the server only handles traffic to domain names that you explicitly define. Login to your DNS control panel and add an A record that points to your server’s IP address. You can also add a CNAME record for the www subdomain, so that anyone who visits either domain.com or www.domain.com will be directed to your server. DNS changes can take up to 72 hours to propagate, therefore visiting the domain shortly after making any changes will more than likely yield an error or lead to unexpected results. Luckily, you can spoof your DNS to instantly use the new IP address, as detailed in this WPEngine article. The logs directory is where the Nginx access and error logs are stored, and the public directory is the site’s root directory which will be publicly accessible. Copy and paste the following configuration, ensuring that you change the server_name, access_log, error_log and root directives to match your domain and file paths. Hit CTRL X followed by Y to save the changes. 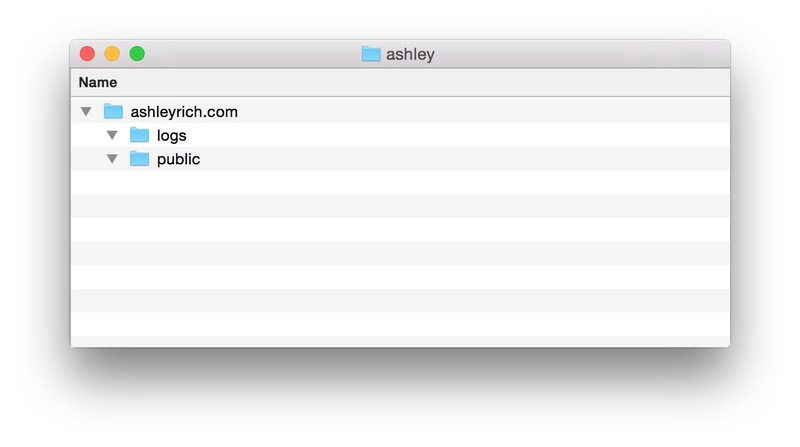 This is a bare-bones server block that informs Nginx to serve the ashleyrich.com domain and www subdomain. It also sets the directory that Nginx should use for the site root and where to store the server log files. The two location blocks essentially tell Nginx to pass any PHP files to PHP-FPM for interpreting. 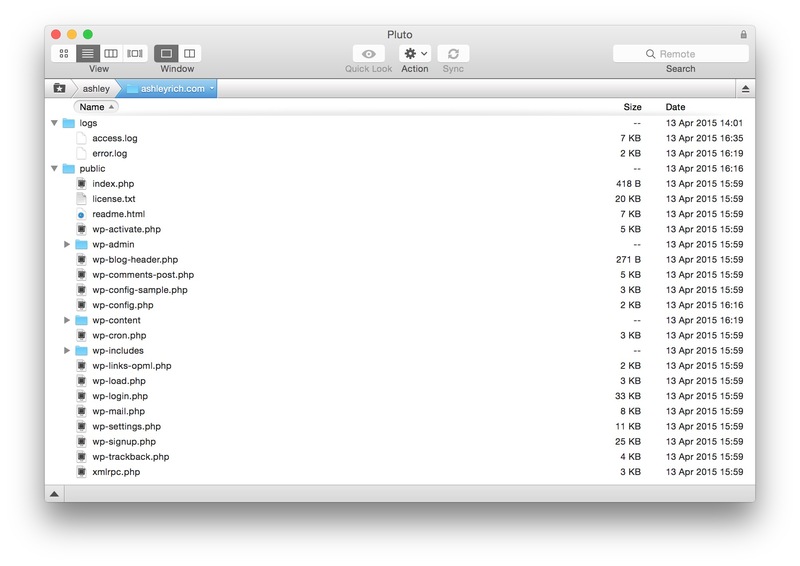 Only files within the sites-enabled directory are automatically loaded. This allows you to easily enable or disable sites by simply adding or removing a symlink. With Nginx configured to serve the new site, it’s time to create a new database for the WordPress installation. When hosting multiple sites on a single server, it’s good practice to create a separate user and database for each individual site. 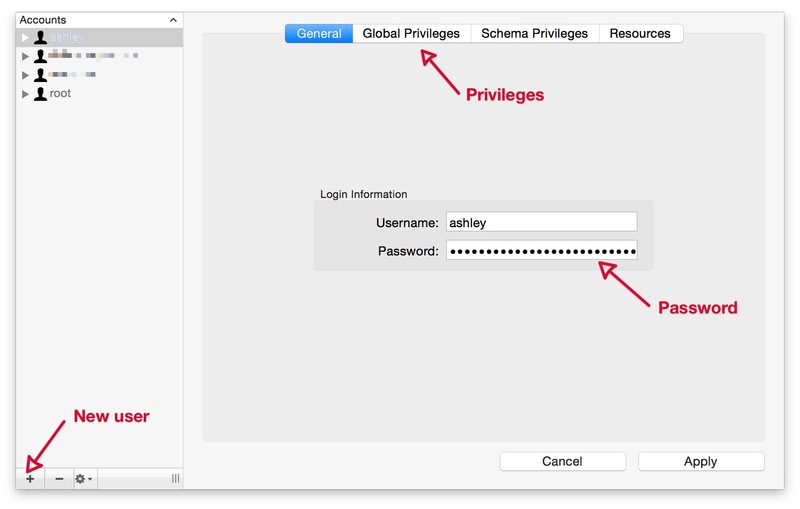 You should also lock down the user privileges so that the user only has access to the databases that they require. Here’s how to do just that. Log into MariaDB with the root user. Although we’re using MariaDB the commands are exactly the same as if using MySQL, because it’s a drop in replacement. MariaDB and MySQL will be used interchangeably throughout the remainder of this post. You’ll be prompted to enter the password which you created when setting up MariaDB. Be very careful as not to overly restrict permissions. Some plugins and major WordPress updates require heightened MySQL privileges (CREATE, DROP, ALTER, etc), therefore revoking them could have adverse effects. The WordPress Codex has more information on the subject, which can be found here. Now that you have Nginx configured and a new database table, it’s time to install WordPress, but before doing so you’ll need to install WP-CLI. 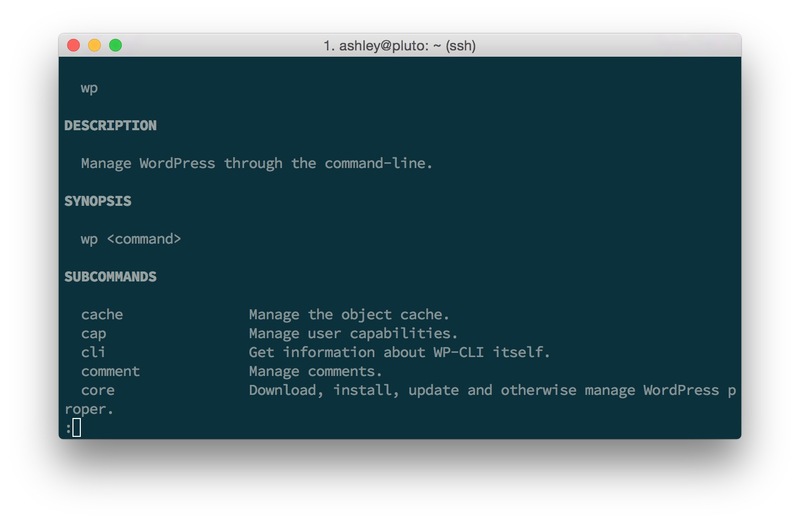 If you have never used WP-CLI before, it’s a command line tool for managing WordPress installations, and greatly simplifies the process of downloading and installing WordPress (plus many other tasks). The command should output information about your current PHP version and a few other details. You can now access the WP-CLI tool by typing wp. 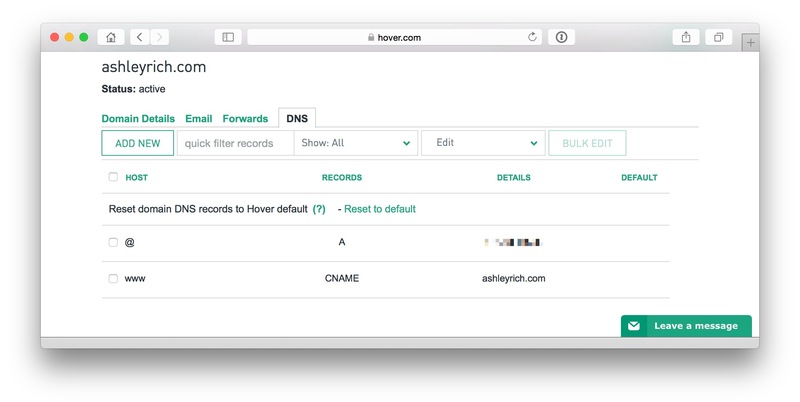 Add the relevant DNS records to the domain. Navigate to your home directory and create the required directory structure for the new site (logs and public). Navigate to the sites-available directory within Nginx and copy an existing config file for the new server block. Ensure you change the relevant directives. 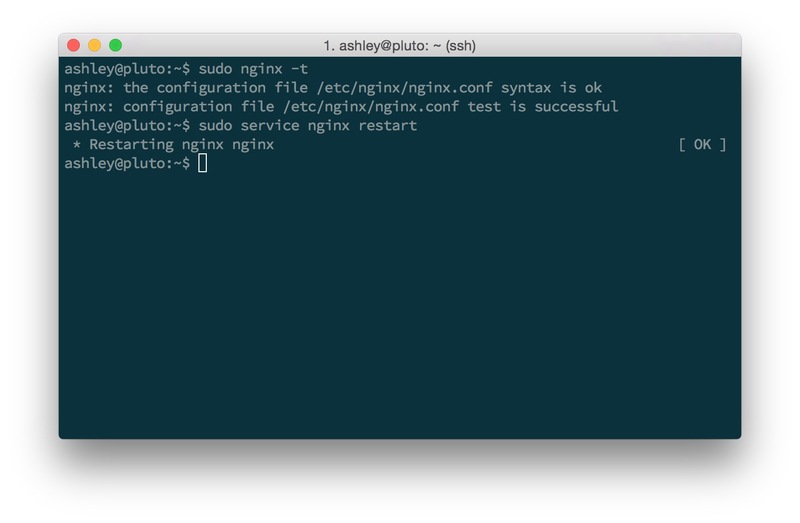 Symlink the config file to the sites-enabled directory to enable the site and restart Nginx. 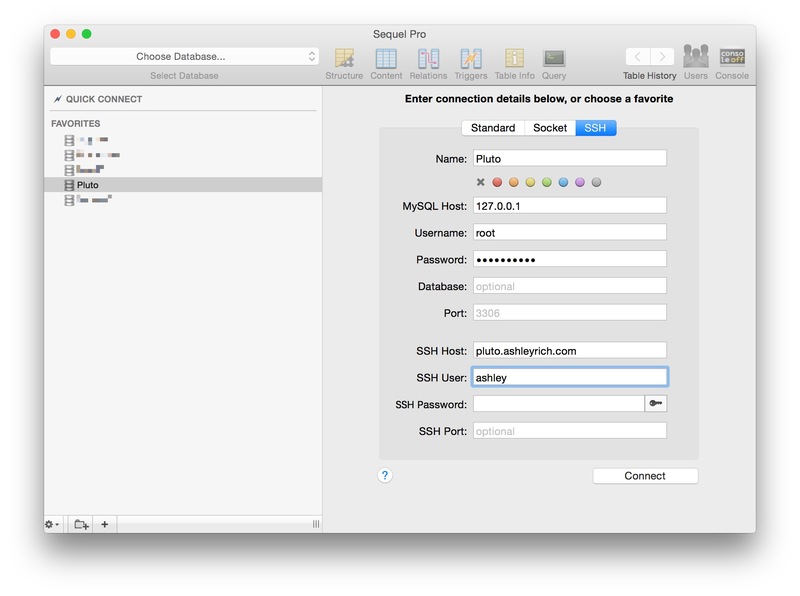 Create a new database and MariaDB user using either the command line, or Sequel Pro (see below). 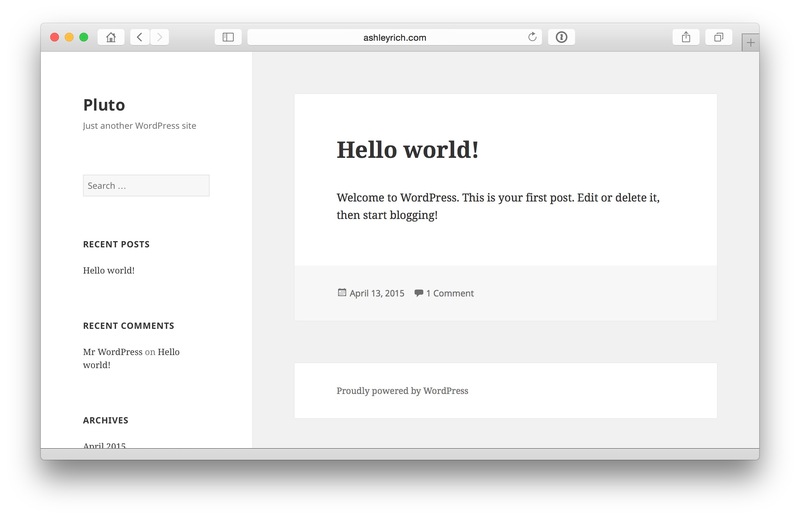 Navigate to the site’s public directory and download, configure and install WordPress using WP-CLI. You are free to add as many additional sites to your server as you like, the only limiting factors are available system resources (CPU, RAM, etc) and bandwidth restrictions imposed by your VPS provider. Both of which can be overcome by upgrading your package. Caching will also greatly reduce system resource usage, which is something I will guide you through in the next post. 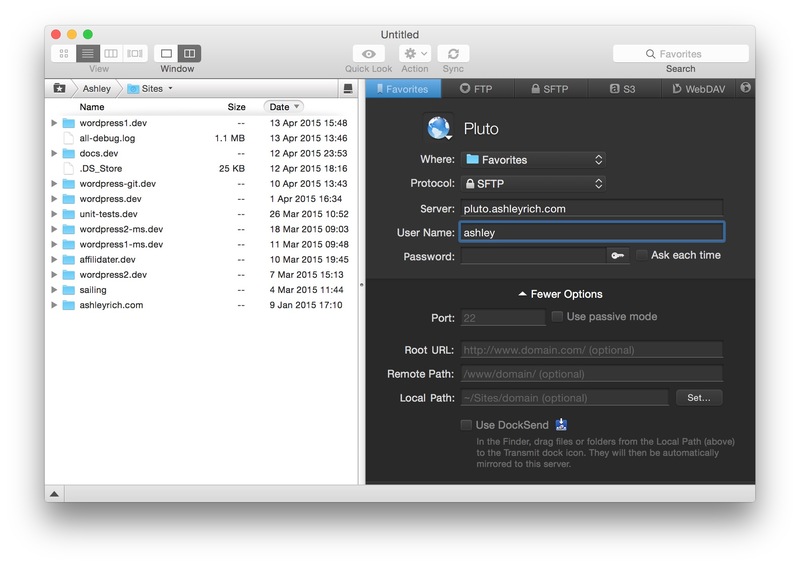 If at any stage you need to upload files to your server, you can easily do so using SFTP. Using an FTP client is often the easiest option. I like to use Transmit. Create a new connection and select SFTP as the protocol. Enter your server credentials and leave the password field blank as Transmit will automatically use the default key within your .ssh directory. You can click the key icon (next to the password field) to choose a custom key file, if you’re not using the default key. Upon saving the settings and connecting to the server, you should be presented with your home directory. From there you can navigate to the site’s root directory. When uploading files to the server, you will not need to change ownership of them as you have configured Nginx and PHP-FPM to run under your user account. Super easy! 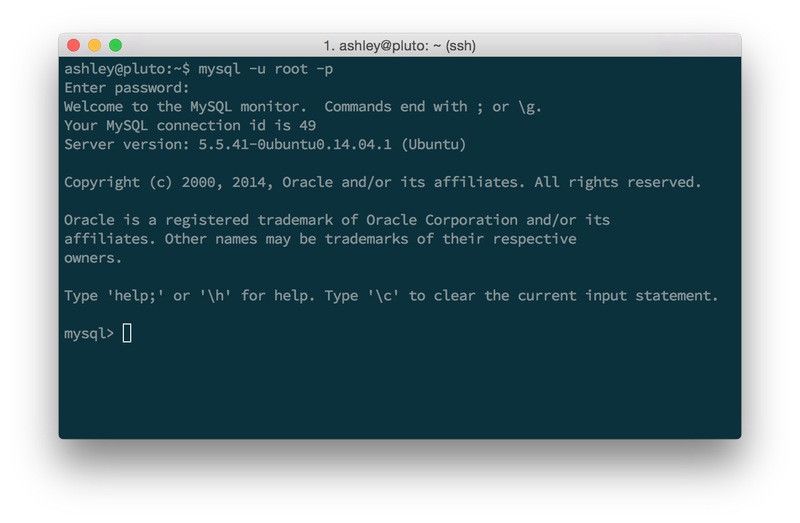 Managing MariaDB/MySQL from the command line can be a major pain, therefore it’s often easier to use a GUI. phpMyAdmin and Adminer are common choices, however they often involve setting up separate sites to host them. Instead, I like to use Sequel Pro, which is a native Mac app. Setup is relatively straightforward, however, because you have configured MySQL to only allow connections from localhost (originating from your server) you need to tunnel the connection through SSH. Luckily, Sequel Pro makes this a breeze. 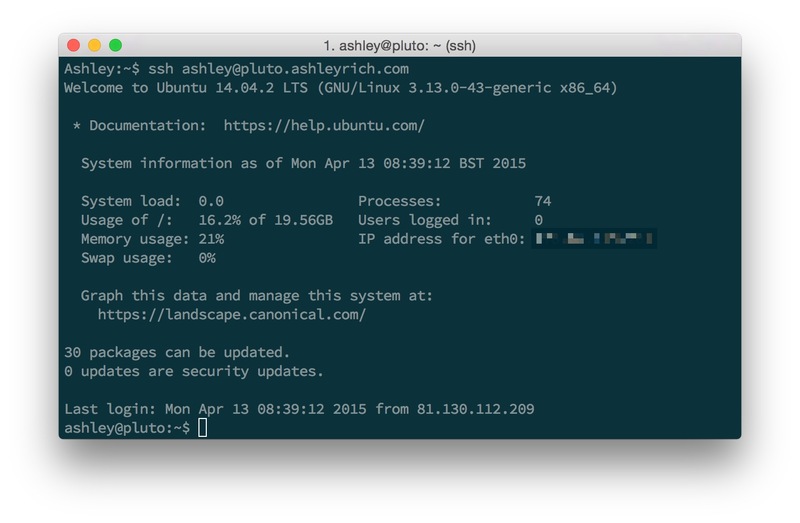 Create a new connection type of SSH and provide your server and database credentials. It’s advised to use the MariaDB root user so that you can manage all databases and create new users. As with Transmit, you do not need to provide a password as Sequel Pro will automatically use the default key from within your .ssh directory. 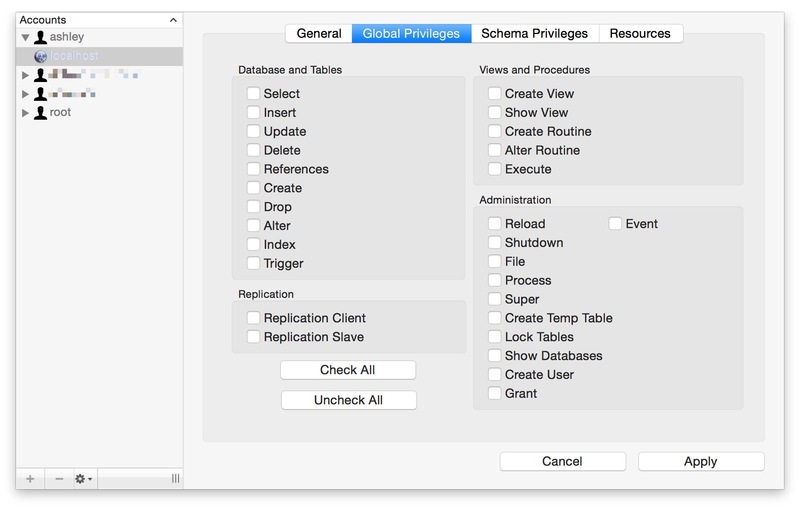 As mentioned earlier, it’s best practice to lock down the privileges for each database user and only give them access to the databases they require. Sequel Pro greatly simplifies this process. From this panel you can create new users, change a user’s privileges and reset their password. Restricting privileges is a trivial process. First remove the global privileges. 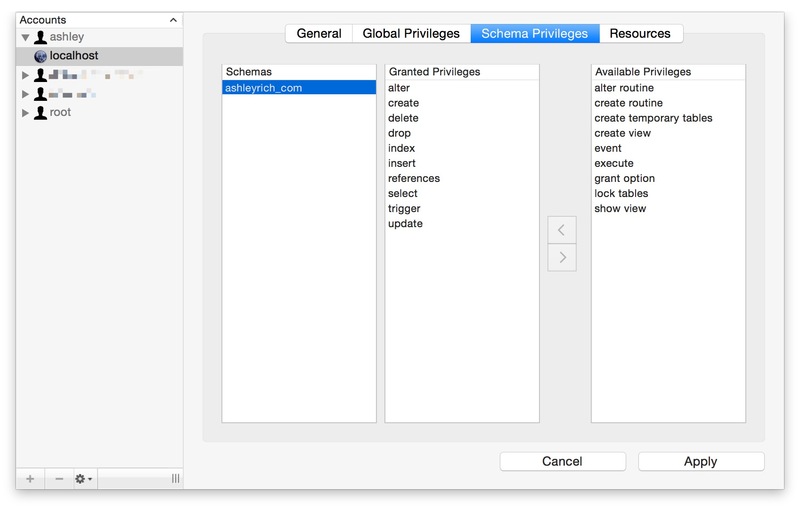 You can then select each individual database that the user needs access to and add only the required schema privileges. That’s all for part 3, if you have any questions please feel free to ask them below. In the next post I will guide you through the process of caching, performance optimization and server monitoring. Stay tuned! This entry was tagged WordPress, MySQL, Linode, Digital Ocean, Hosting, Linux, Ubuntu, Nginx, WP-CLI.